Slow news day is slow, even Derpy’s Mailbag is very light this week. We’ll call this an art edition of the Mailbag, as after I went through the mail and posted up what I got, I noticed 4 out of the 5 were artwork submissions. Hopefully some news happens in a day or two, and remember our submission box is always open if you got something. On a random note, there was almost news today, as someone appeared on Ponychan pretending to be Ed Rosario (a Top Draw animator). The troll answered questions for a good two hours and even had the mods convinced it was him (via a fake @dhxmedia.com email). It was enough that Seth reported on it, and I’ll admit I was transcribing the Q&A. But low and behold, total troll thread. Kind of funny. And now for the mailbag. Ciberman001 can be found here. Truthfully I remember using the MLP Skeletor post awhile ago somewhere, and I think I’ve used the comics too. But the email has been sitting in my pending box for awhile so I figured it was time to shine some light on it. Awesome work. I do love me some stained glass windows. There’s a series on DA of someone doing windows for each pony, but this was dropped in our mailbox. Made by Marissa Garner, no you cannot order the actual window, but prints are available on her Etsy page. She also has a personal page here, and a deviant art account here. #003 – Air Derpy by S.H. YouTube video found here. 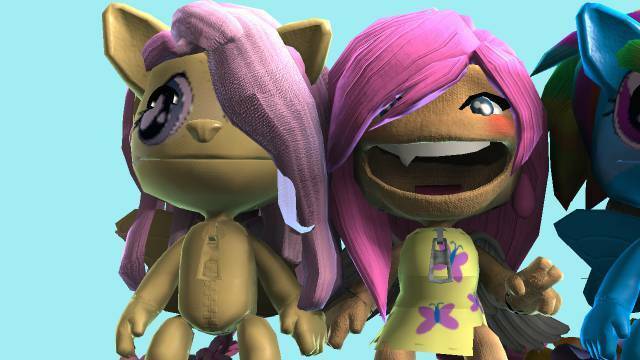 There’s been a few versions of LBP pony characters that we’ve featured before. Have to admit, that Ponychan thread got everyone good. I think the also got the Devs of the Mame6 Fighting is Magic team as well. Most funnest thing is that the bloke left alot of clues as well, and everyone was way too into the moment to notice. It seemed pretty real, though partially cause the mods of Ponychan flagged him as Show Staff, with the only evidence of getting an e-mail from an @dhxmedia.com. What tipped me off to a troll was the fact he started to talk about Studio B people, and well, Ed Rosario is from Top Draw, which is in the Philippines. But of course its not unheard of, the /co/ MLPGs use to get a visit from FlashInThePan, who was a confirmed animator from Studio B. That skeletor image is the BEST thing ever!